I love Rao’s® restaurant. Was there very recently and enjoyed it beyond all expectation. Make no mistake, the experience was seismic, intimate as it could have been outside a bedroom – wait staff literally sits at your table, pays real attention, even looks you in the eye (it’s NYC! ), laughs at your jokes, all the while guiding you through your menu. Remarkably Rao’s has enjoyed this ride for nearly 120 years. Standing center stage is Frank Pellegrino, the larger than life, master of his universe. He’s one of the owners and also of “Goodfellas” movie fame. A man who is preternaturally comfortable – with anyone. He finds your button and enjoys delighting you. Lucky us: He stayed at our table for hours. Such amazing, infectious, general exuberance and facility for storytelling and extensive knowledge of doo-wop, “music for the soul.” At one point, he was so into the moment, he grabbed my hand and sang a Frank Sinatra tune in front of my wife and dearest friends. Mind-blowing. The space is small, 10 tables, but overflowing with pictures of everybody big – in sports, entertainment, you name it. What gave me instant street cred that night? He found out I spent my birthday a few years back at Sinatra’s Palm Springs house. Add that to the fact I was dining with a close friend of his family. What a night. It got later and later and no one noticed. From table top to bar stool, I ascended in to gastronomic heaven! So in a very real way, East Harlem owns Italian food. Let’s note too that Rao’s, as a brand, has embraced jars of “gravy” sold throughout America – “my home run,” as Frank refers to that side of his dynasty. I mention all this about Rao’s because it sits at the rare firmament of great personal experiences. The experience is not replicable. In the most the positive way, it executes your senses. It delivers beyond what’s preconceived in your head. You can’t be there and not be intoxicated – figuratively and literally — by the care taken with the food, the music; by watching people indulge themselves; by the space and the ultimate beauty and magic of a New Yorker’s old New York. One doesn’t forget these things. 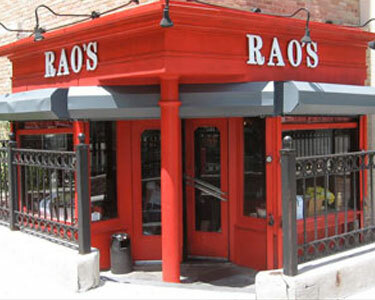 Its air is so rarefied it remains successful in the face unremitting change – no matter how super-instantly- connected we become, Rao’s makes its bones every day in the oldest-school way: By killing pretense and keeping its promises. (On some occasions, it’s alleged, when A-list celebs are in the house, Frank will confiscate all mobile devices and hold them at the bar.) Rao’s essence is imbedded in the sacred tradition (experience) of sitting around a fire singing, tell stories to each other, and eating like fools – the very experiences that makes us all happy campers. Frank sums up his approach to trailblazing: Keep your nose firmly planted in what you know, while coming up for air long enough to fret about what you don’t. Anticipate what’s around the corner. Seeing the Road Ahead is why Rao’s opened in Las Vegas/LA and continues pleasing everybody lucky enough to snag a table. Not even Warren Buffet can “charm” his way into a seat! Read about epic battles over tables. October 6, 2016 /by MaXas3!